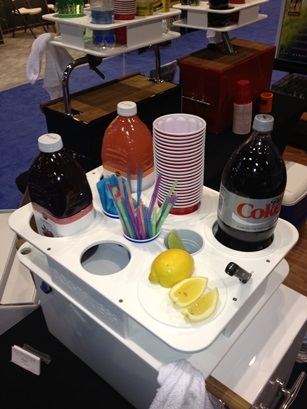 Reel Adrenaline Energy Drinks has released its newest product, the Docktail Bar, a multi-functional portable dry bar and beverage mixing station for boats at ICAST 2014. The Docktail Bar is available in two options to accommodate individual budgets and preferences: Docktail Semi Custom Bar and the Docktail Fully Custom Bar. Each product can be customized with 5 different inserts to make that family getaway or social gathering more fun and enjoyable. Four bottle sizing inserts can reliably accommodate most bottles and cans from 1.75 liters to basic red plastic party cups down to 8.4-ounce energy drinks. A separate insert sports a practical cutting board for dicing lemons, limes and any other cocktail garnishes. Two knife holders sit atop the bar while beneath are two more accessory slots to hang bottle openers, clip a towel or whatever else will enhance your Docktail hour. The Docktail Bar is easy to clean, durable and folds flat for easy storage. Made of a weather-resistant durable polymer material and fastened with stainless steel hardware, Docktail Bar can be installed using multiple mounting options including a rod holder, stainless steel rail mounts, suction cups, etc.For more information, please visit www.DocktailBar.com.